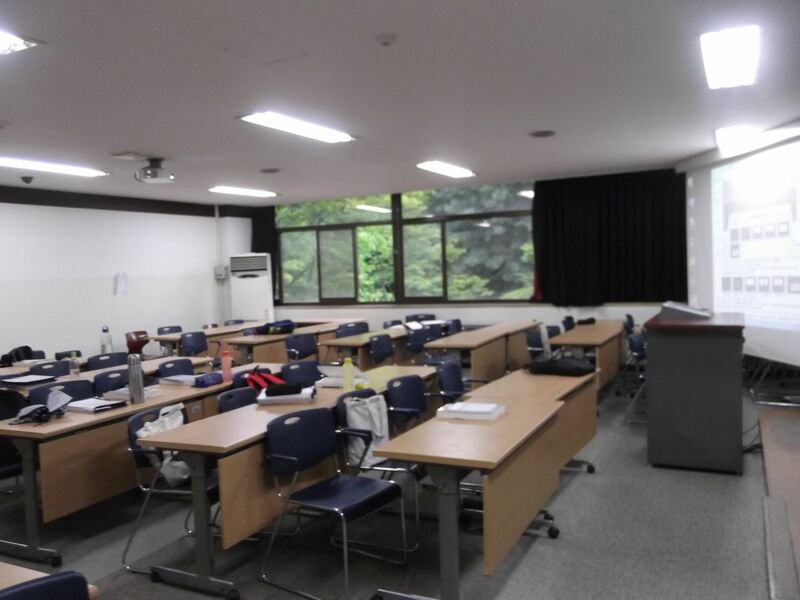 In my first week in Korea I explored a little bit the University and start to get to know the group of students and teachers for this summer school. So, my aim for my first weekend was to polish my lecture on what I perceived should be suitable. Then on my first lecture, which was on Monday 8th I got a surprised. For first time I live the experience to frighten students. I say this because that is what I perceived when I was looking at their faces. Later it was confirmed my impressions as some of the students changed of course the next day. It has’t happened to me before this, so I wonder why? My teaching approach is on active learning. I am not into lecturing. => This might be a new method for them. Is this scary? I had been always involved in computer science (CS) or engineering department, i.e. technical fields. => At the moment the students are not really in CS. They are from other majors. Might I be too technical for them? I am blessed because most of my work has been with researchers and graduate students => all students are undergrad. Am I flying too high? Honestly, I do not have an answer yet about why I scare them. But I am working into finding out. My main hypothesis is that I am working with undergrad students from different disciplines, so I have to talk properly to them and support them more. So I am adapting my course accordingly. On Tuesday and Thursday I have been exploring how to communicate and support the students better to achieve a successful and enjoyable learning experience in this course. Beyond doubt the students will wonder, think and design in this lecture. The level of the course will be high, but they should not be scared about it. Unquestionably, it will be a VERY INTERESTING month! Meanwhile I can share the lecture room facilities. 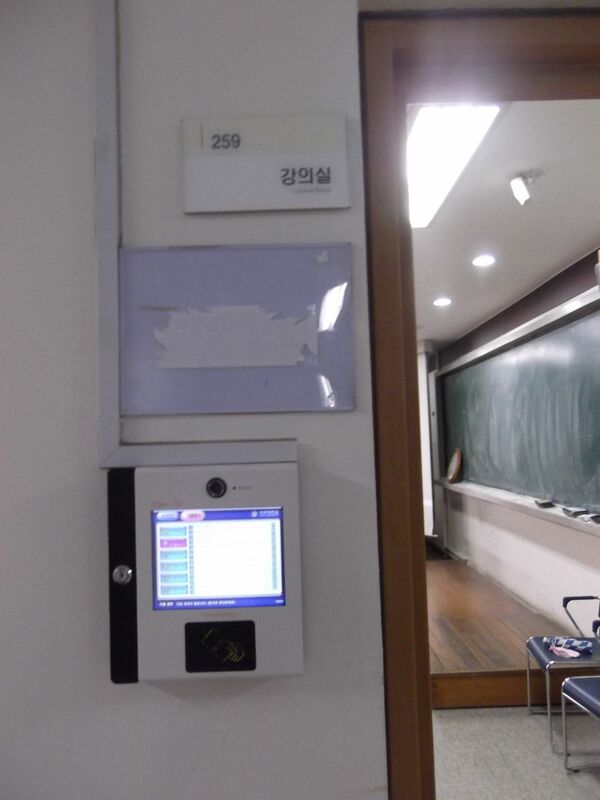 Entrance to the normal lecture room. 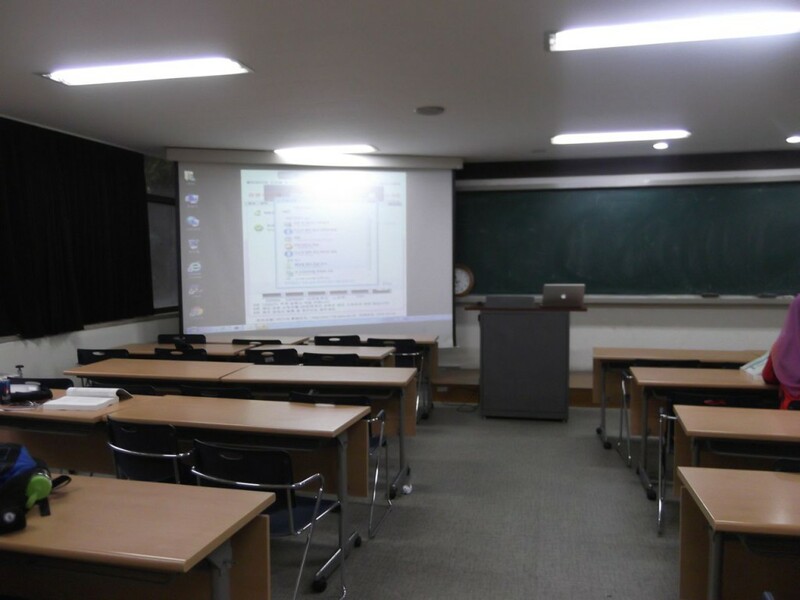 This is the room where I lecture. Next is the close up to the digital device. 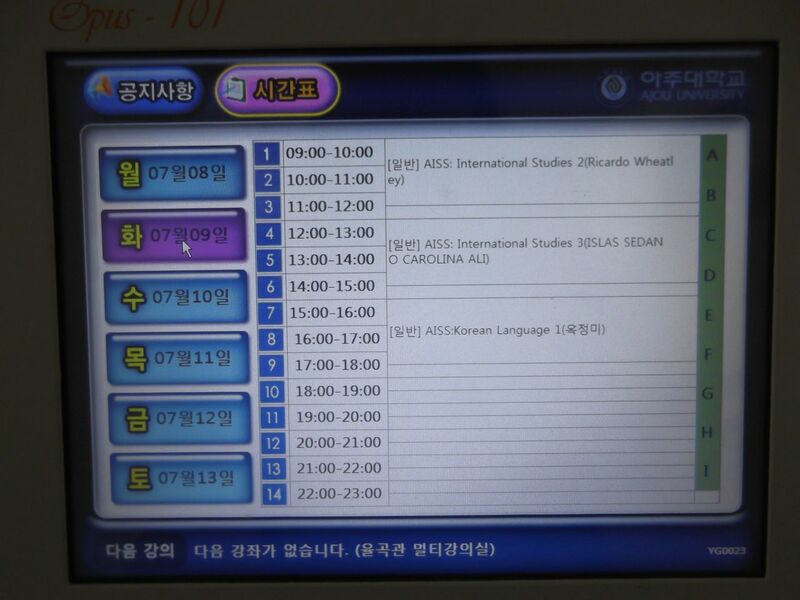 Closeup to the system indicating the time schedule for this specific classroom. Apparently in the normal school year the students put their student cards on the reader of this device as an assistant record. It is strange to do not have a desk and to do not stand at the same floor level than the students. 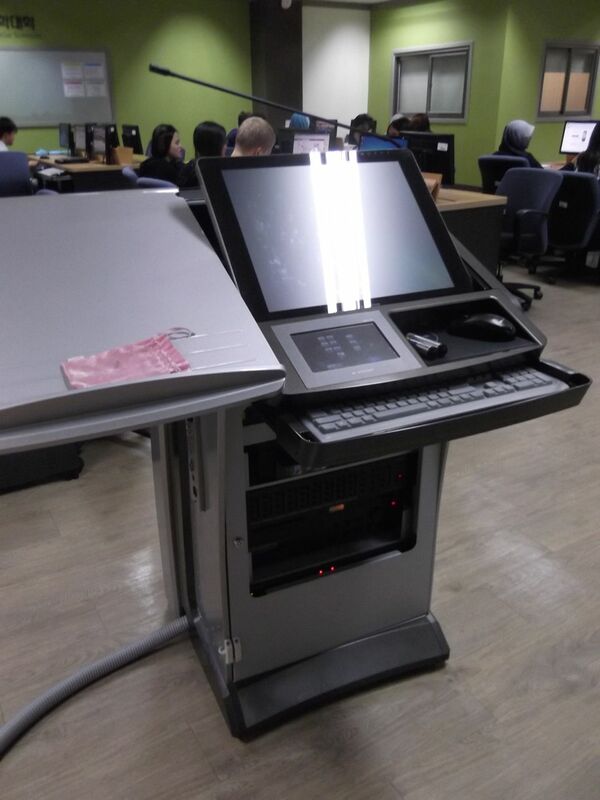 On the other hand, the design of the lecturer’s computer is very handy. I really like it! I am switching of classrooms. One hour I am in the traditional classroom and the rest of the time at the computer room. The computer room is really modern and functional. Again, I like the computer for the presenter. Honestly very practical and functional its design! 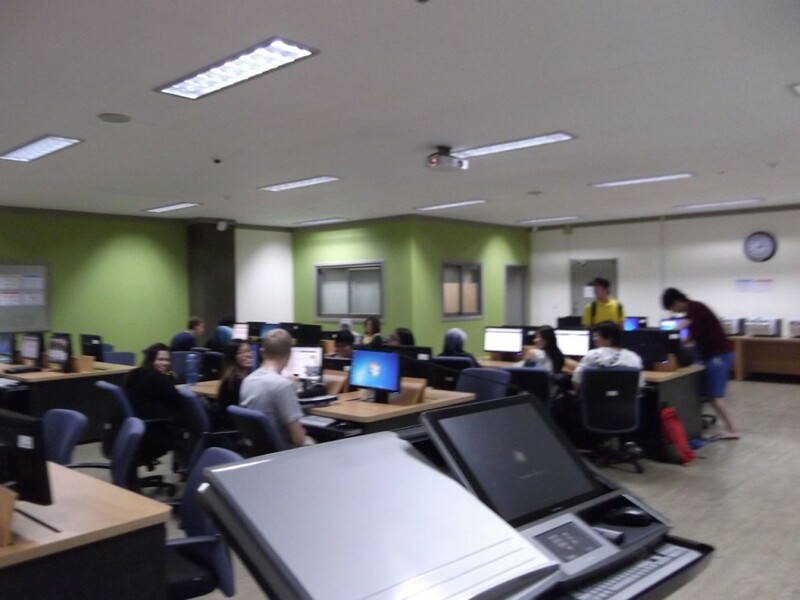 This entry was posted in education and tagged kore, teaching on July 11, 2013 by caislas.